It was cold, not with the immediate inrush of chill with which I normally associate rising before daybreak in winter, but with a slow-gathering and chastening freeze. I opened the door telling myself that a pair of shorts and a single vest would be more than sufficient. There was no frost or none that I could see, among the houses on the estate, and no suggestion that it was going to rain. What I could see even in the dark but underestimated was a gloom of mist and fog which should have been familiar from the black and white films of postwar London. I ignored it. I left the house, my feet tapping tentatively on the ground. Five minutes away, beside the park, I watched my glasses slowly mist from the contrast between my warm breathing and the frozen air. On the ground, finally, the puddles had iced over. Running beside the canal, murky with glass strands and still, I felt an unfamiliar passage of skin; the tops of my arms, just where they spilled out from my short-sleeved running top. 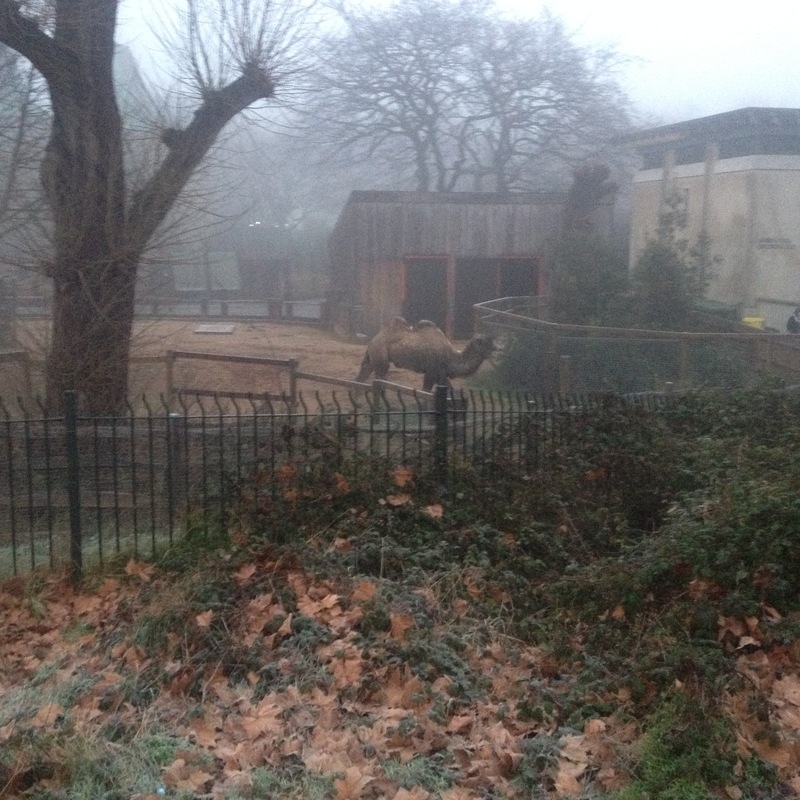 The cold was confirmed finally by the glare I saw from this camel in Regent’s Park, bitter as it surveyed an expanse of hard ground, and nostalgic for the warm air of its desert youth. How do you know the camel was not born in capitivity?